I love talking about gear. What photographer doesn’t? Last month I got the chance to do a lot of “talking” about it when Mighty Goods website interviewed me. Along with 15 other outdoor photographers, of course. 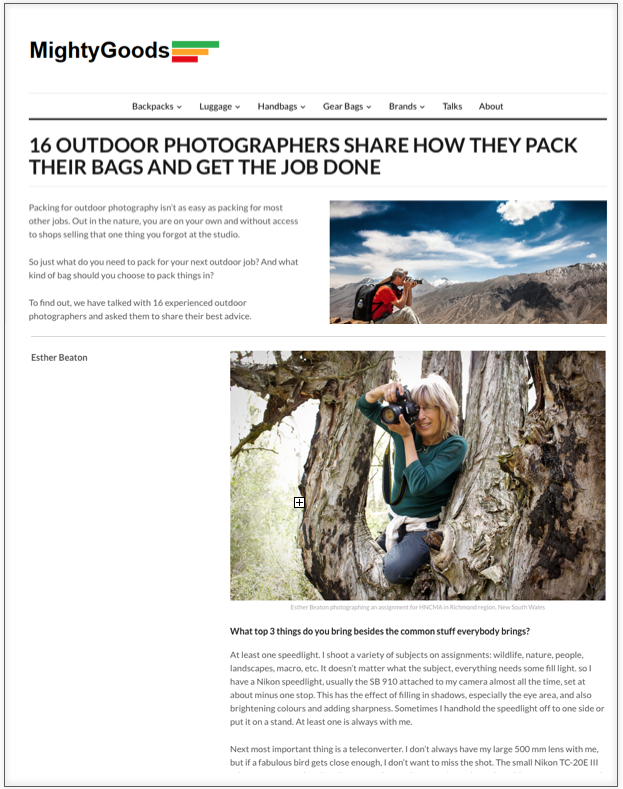 It’s a website devoted to bags of all sorts and they represent some great options for photographers, from lightweight to serious. I own a range of cases and packs. I keep them sitting on my shelves empty – waiting to be packed for the assignment that suits them. This article covers one of my most frequently used bags: a medium-sized backpack. Once you are on the MightyGoods.com page, my interview is very easy to find: just scroll down to the very last one!